At the annual press conference on June 9th 2015, the German Publishers and Booksellers Association not only presented economic data and key statistics about the German book market in general, but also focused on trends and changes within the German ebook market. All statistics can be found below in this article. The key finding, already being reported in last week’s article on the German book market 2014 in general, was that German ebook sales have grown slightly in comparison to last year: ebooks are now responsible for 4.3% share of sales being worth 24.8 million euros and amounting to a rise of 7.6% compared to last year’s 3.9% share of sales and 21.5 million euros. Looking at the development of sales from 2010 to 2014, one can see that general growth of the ebook market has slowed down considerably: after the all-time-high of growth in 2012 (nearly 200%), sales decelerated substantially. This trend is consistent with what we see with the ebook markets in the UK and the US: after years of growth, a saturation effect can be found within the market for digital reading. This shows: although ebooks have been successfully established on the market, they by far do not dominate it. The number of titles bought by customers remained stable with 6.4 titles per year, implying that more readers entered the market. This is consistent with the numbers presented by the Börsenverein, which stated that half a million more consumers bought ebooks in 2014, meaning that now 5.7% of German book consumers buy digital reading material. Starting with only 1% readers in 2010, acceptance of ebooks has been slow, but steadily on the rise. 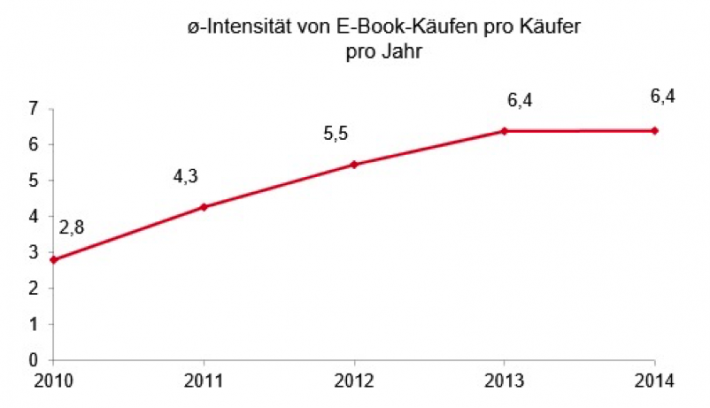 The average price German readers had to pay for their ebooks continuously dropped within the last years and settled at 7.08 euros per title in 2014. The reasons for this are diverse: more (and cheap) self-publishing titles are entering the market and publishing houses are testing several pricing models for their ebooks, flat rates being one of them. While the readers appetite for children’s books seemed to drop slightly (from 7% in 2013 to 5% in 2014), interest in fiction and travel books both gained one percentage point. Overall it can be said that interest in all genres remained relatively stable with fiction (84%) clearly being the category for digital readers. What will the future bring? Rumor (and Börsenverein prediction) has it, that the number of consumers reading both print and ebooks will decrease slightly (an estimated 3%) within this year, while the exclusive use of print books will be significantly on the rise (from 38% in 2014 to an estimated 45% in 2015). Next year’s sales and the Börsenverein’s annual press conference will show if this estimate of the German ebook market has been correct.